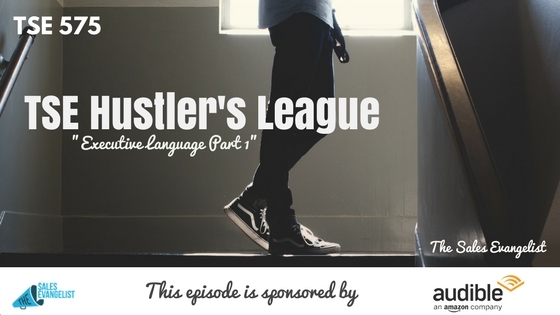 Today, we’re pulling out another snippet from one of our sessions over at the TSE Hustler’s League. It’s a great community of members, new to sales and experts alike, and we all come together because they all want to sharpen their skills, increase their opportunity rates, and to close more deals. This week’s topic is focused on value, specifically speaking the language of executives so you can look valuable. We tend to have this mindset that we don’t have the ability to speak to people who are in the higher ranks such as executives. The only way this is the case is if you don’t know what to speak. One survey suggests that business issues, business trends, and business insights are 4x more than traditional relationships and product knowledge. Conversely, several sales people when they go into a sales conversation, focus more on product knowledge. And it’s just traditional relationships you’re building. Executives don’t want to hear that stuff. They want business insights. This is why it’s important to do your research before your call. Know your ideal customer. Know the industry you’re going after and understand their unconsidered needs or regulatory changes (ex. Health Care policy changes). Your champion is someone in the organization, the manager for example, that helps you try to get to their executive and once you’re able to speak to that CEO or executive, speak about your champion. Speak about revenues, profitability, percentages, growth, or strategic words. Use the information you on their website to have strategic conversations to make you sound more intelligent. Study the language of executives. Learn what executives like the most, what they want to see and understand. They want to learn about the bigger picture. Find out what their initiatives are and speak to that. Join us at the TSE Hustler’s League.